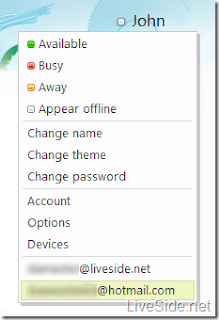 "We started off a few months ago showing you what the new Windows Live Wave 4 web services header will look like, and we told you that every Windows Live web page will have Web Messenger incorporated into its header. Unfortunately, we weren’t able to get hold of any screenshots as we couldn’t quite get it to work back then. But today we’re able to show you how Web Messenger actually looks, with this new feature fully functional in the Wave 4 web services header. Here’s what it looks like, under the expanded “Messenger” menu:"